2017 Put-In-Bay races are done for another year. 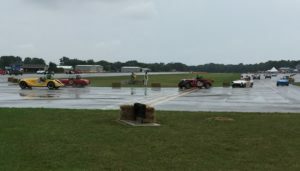 The races are staged every year (8th year in a row) on the airport runways of Bass Island in Lake Eire. In the 50’s the races were run through town on the city streets. 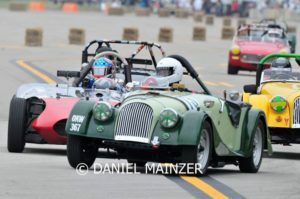 While my Morgan continues to improve in speed and reliability we still had a few problems. This time what we thought was Weber carb jetting problems turned out to be an intermittently bad Petronix coil. Luckily Jim Besst (another Morgan racer) had a spare coil, that I had given him some time ago, with him. Race day brought rain showers that made the track a bit slick. The final race was going well when about 3 laps into a 10 lap race, at one of the quick right left corners, a dive bombing MG TD forced me off my line and into a hay bale that a previous car had bumped out into the edge of the track. While I knew something was wrong I did continue on for another lap. Steering seemed to be getting progressively harder so I exited the track at my paddock entrance only to be stopped by the paddock steward and told to reverse. He then proceeded to remove a complete hay bale still tied with string. Once removed everything worked as it should with no damage to the Morgan other than a small crack in the left rear fiberglass fender. 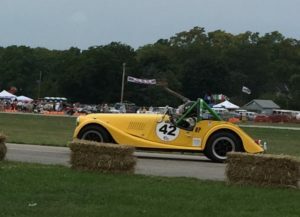 The Morgan is all cleaned up as of this morning and we will leave Put-In-Bay for another year and head on to Watkins Glen Sunday to race at the Glen the following weekend. 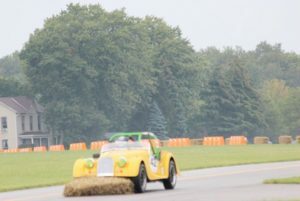 Jim Besst’s Morgan 4/4, in the same race, made 9 1/2 laps before missing a corner and landing on top of some hay bales keeping Jim from finishing the last half of the last lap. No apparent damage to Jim’s Morgan either. At the final lunch it was suggested that the airport authority was looking to offer me a job sweeping the goose poop from the airport run ways. MOGSouth Fall Meet Attendees. Make Your Saturday Dinner Choices – Now!! Greetings from Clayton GA! The Fall Meet will soon be here! It is now time to make your choice for dinner to be served at the Kingwood Resort on Saturday evening (September 16th) at the Fall Meet. There have been a lot of distressing items in the news lately about the future of the automobile as we know it and while we cannot predict with much accuracy what will transpire in the years to come, we are sure that it will be a different world from the one that we have known for so long. Fresh on the heels of similar news from France and Norway, the United Kingdom recently announced that it intends to ban the sale of all diesel and gasoline powered automobiles by 2040. This announcement comes not long after Volvo decided to focus on building only pure electrics and hybrids by the end of this decade. A few months ago I read something from Bob Lutz (formerly an executive at Ford, Chrysler and GM) proclaiming his gratitude for having lived through the golden age of the automobile and personal autonomy (the implication being that such an era is now over) and his is not the only voice that has spoken longingly for a time that seems on the way out. What does this tremulous future hold for classic automotive enthusiasts? I think it will be an even better time than ever to drive a real classic sports car. As we surrender our personal transportation to autonomous or semi-autonomous vehicles, we will feel the urge (now more than ever) to drive a car under our very own control. With inspiration from James Earl Jones, I think that for reasons that we cannot fathom we will feel compelled to lift up the bonnet and tinker with the carbs or set the timing because it will fulfill an elemental need that we all share to fix things and make them work when they are broken. As long as British sports cars survive in drivable form there will be drivers who want to drive them and we will be here to supply the parts. The coming decades may be the proverbial time of cholera for true car lovers, but maybe not. More self-driving vehicles may mean less less traffic and reduced danger for those of us in our Little British Cars. The only way to stave off this off is to continue driving our cars with abandon as the workers at Abingdon, Longbridge and Coventry intended. The more people that see these cars on the road, the more there will be new owners to covet them when it comes time to pass them on. We will have some customized gifts for all of the MOGSouth Fall Meet attendees. For everyone attending, please email me at richardihns@gmail.com your name and address as you would like to have on the gift. This will be an individual gift. Unfortunately, being a surprise, we cannot provide any more information at this time. This information is needed ASAP to make sure we have it done on time. In a role reversal, Brad and Connie Rustin inherited their shiny 1968 Datsun 2000 from their son. The couple bought the roadster more than a decade ago and fixed it up over eight years — including a complete frame-off restoration — so their son would have a cool car to drive when he was old enough. The teenager enjoyed some hours behind the wheel but as he matured, shot up to 6 foot 5 inches. Now he “can’t get into it,” says Brad Rustin, who too has a personal interest in the car. “I actually owned a 1967 1/2 when I was in the Marine Corps,” he said. Rustin husband and wife motored the classic Japanese sports car in a parade-like morning drive and parked it at Magnolia Gardens for a show July 15 in recognition of National Car Collector Appreciation Day. The collector day cruise-in, rekindled in 2016, attracted 52 cars this year, said Trevor Shelor, head of the local Antique Automobile Club of America chapter and appreciation day organizer. He brought three models — a 1953 Ford, 1926 Model A with a 19th century sleigh built for the seats and the city of Charleston’s 1949 Chevy police car. “Just celebrate the day how ever you can,” Shelor said. The Charleston area began celebrating National Car Collector Appreciation Day in 2010. The congressionally authorized event sponsored by the Specialty Equipment Manufacturers Association takes place in July, with localities selecting dates. Charleston has the only sanctioned event in South Carolina. In the Lowcountry, the car collector day originally was a show, then evolved into a parade loop from Brittlebank Park around downtown Charleston. Last year, the parade started in Mount Pleasant due to a conflict at the Ashley River site. The car show returned last year at Magnolia Gardens, as models crossed the Ashley River and followed S.C. Highway 61 west. For 2017, the collector car route followed Savannah Highway to Davison Road near Hollywood, headed out toward Summerville, then turned east on S.C. Highway 61 to the plantation. Justin Hustead of West Ashley wheeled his red 1933 Plymouth street rod with all-steel body and Corvette engine to the cruise-in, held on a grassy field near the sprawling house at Magnolia Gardens. The collector day drive and show was “fine,” said the antique car owner, who bought the 84-year-old Plymouth a year ago in Florida. 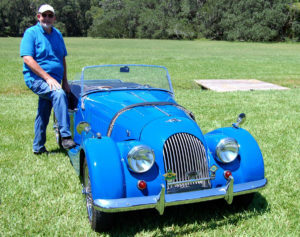 Displaying a 1967 Morgan Plus 4 with Kingfisher blue paint was Ken Kreuzer of Summerville. “In Europe, you can still get one,” he says. Most of the attendees were from the Charleston area, although there were exceptions. Khushi and Sethi Salil of New York were visiting Charleston for the first time and went to Magnolia Gardens. They saw the car fest and came by to check out the classics. “I’ve never been around Charleston,” said Jeffrey McCants, of Brevard, North Carolina, who displayed his 2014 Chevy Camaro. “We were actually on vacation and heard about it,” he said. McCants is fond of Camaros, noting that his father owned a 1988 model. “It’s cool,” McCants said.